After many years working in an office I decided to change my life 360 degrees and work for something that I’m passionate about and makes myself and other people happy. After some research I found Creative Mojo, I have always been interested in Art and Craft but I didn’t have courage enough to convert a hobby in my passion and my job. I’m a very responsible, caring, happy, patient and creative person that makes me the perfect person to provide a quality class. I have always felt I was good at helping vulnerable people and try to make a smile on the faces of everyone I work with. I am a very positive person with lots of energy and I try to bring these qualities to the classes, providing an amazing atmosphere with which all the residents are involved, creating a connection in between the teacher and the person who take the class. Why not get in touch to try a session, either call me by phone or drop me an email. 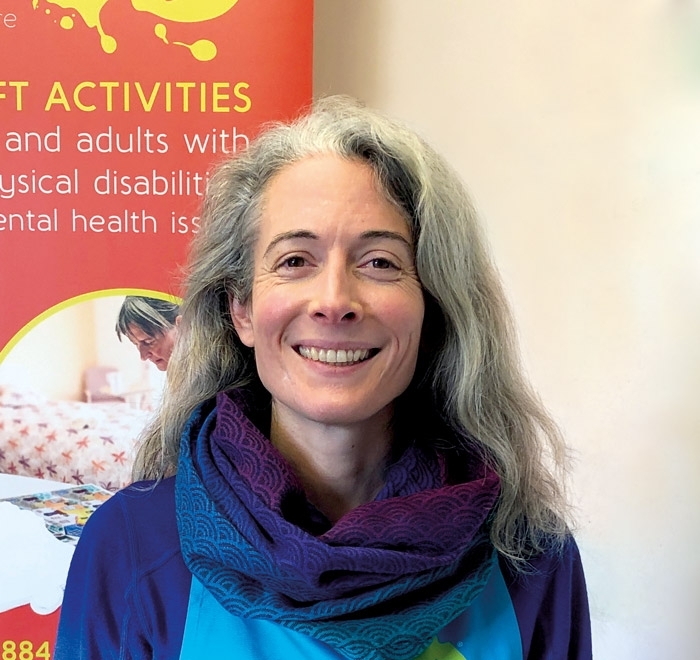 I am lucky enough to have over 10 years’ experience of working within the learning disability community, in residential and supported living homes and at a local social centre. Alongside this I have also worked with individuals with autism, dementia as well as hearing and visual impairments. I regularly undertake the normally training requirements of a support worker and over recent years I have completed extra courses in autism, dementia and safeguarding. I have a working knowledge of Makaton and the use of other non-verbal communication. I have a lifelong passion for anything crafty and like nothing better than sharing this with others. I’ve always had an interest in being creative and crafting. After many years in accountancy I finally decided to do something I really enjoy and gave up accountancy to concentrate on a multitude of craft activities. 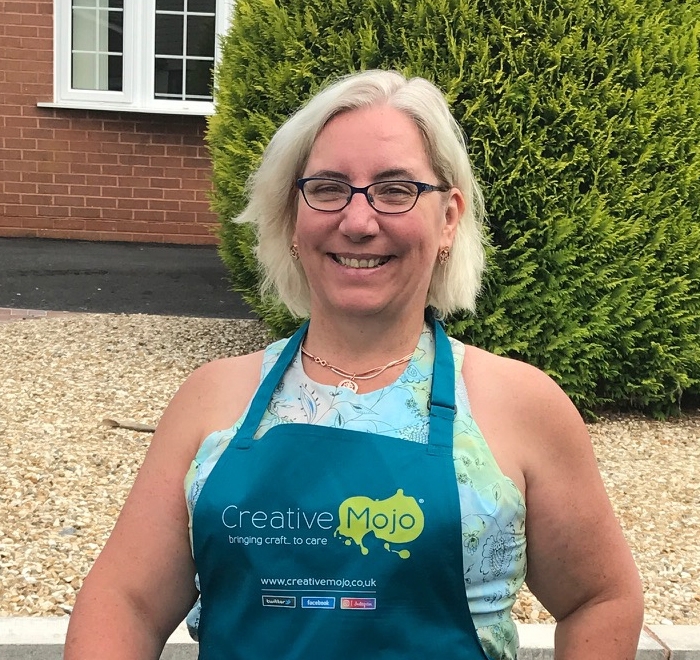 Creative Mojo has given me the opportunity to combine my love for crafting with my desire to help others get pleasure out of achieving and enjoying something creative. 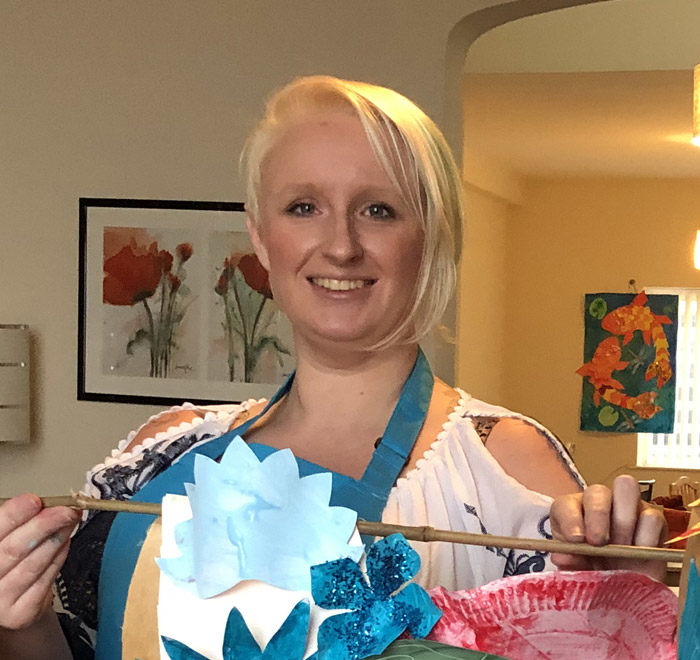 I am great believer that crafting can help improve your physical, mental and emotional wellbeing and can think of nothing better than being able to share this with others. Ever since I can remember I have loved painting and creating my own masterpieces, mainly through furniture painting and large murals whilst living in Spain. Over the years I have had so many opportunities to accomplish my desire of working with art whilst running my own business. I have gained so much experience from nursing, caring for the elderly and disabled, to social work, working alongside families whose children had learning disabilities. As Part of my community work over the years, I have set up groups within South Wales and have been able to combine and utilise all of my skills. 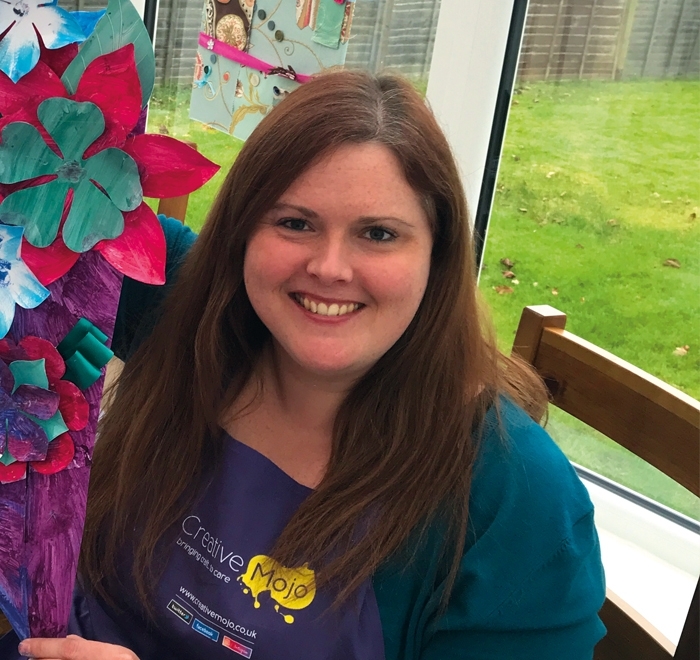 Becoming a carer to a child with a learning disability has given me the desire to be creative and help give people an opportunity to fully engage in creating something beautiful. Thanks to Creative Mojo I once again have an opportunity to bring a little sunshine to other people’s lives. 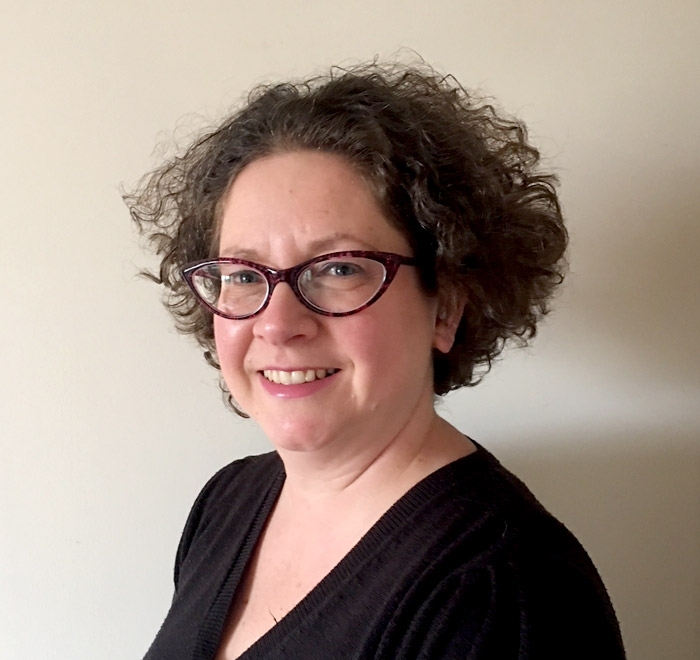 I live in Winchester with my husband and 2 children, when my 1st child was born I knew that it was time to move away from my career in finance and concentrate on something more fulfilling. I started my own wedding cake business and realised how important being creative was for me. To encourage myself to continue incorporating creativity in my career I also become a fully qualified nail technician. 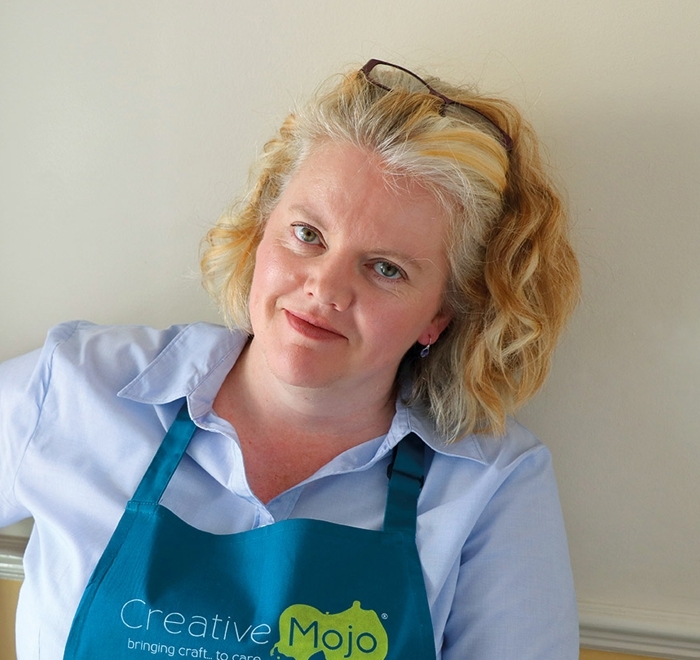 I joined Creative Mojo because I think that expressing yourself creatively is incredibly important. I truly believe that everyone should be given the opportunity to create their own art. I am passionate about helping people express themselves creatively and Creative Mojo is the perfect way for me to do this. I am an art-graduate and qualified specialist teacher assistant. 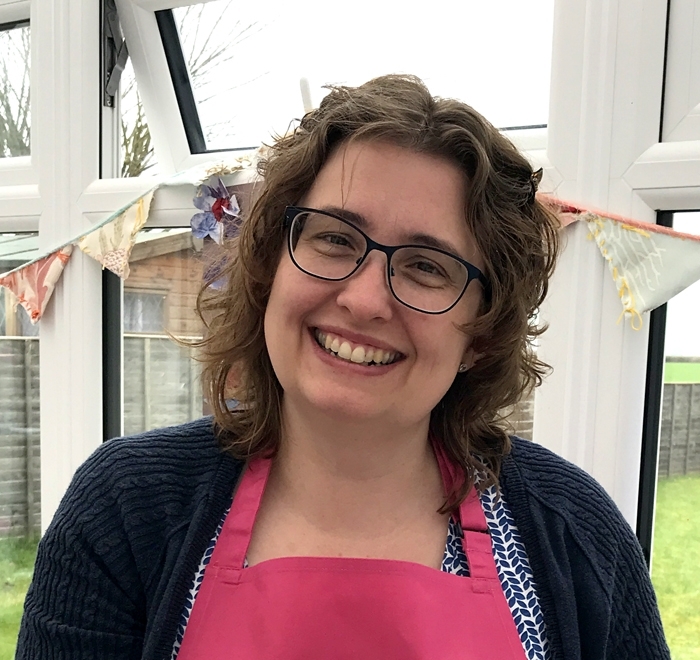 I gained experience in Norfolk schools, both main stream and disability, and have worked with all ages and abilities, doing a range of activities at my local church. My husband Darren is a detailed portrait artist. He has eight years experience supporting his severely disabled step-son, and several months living with, and caring for, is eighty-seven year old mother-in-law. He also has friends with disabilities that he helps to train at the gym, so has had good experience providing care and assistance in this area. 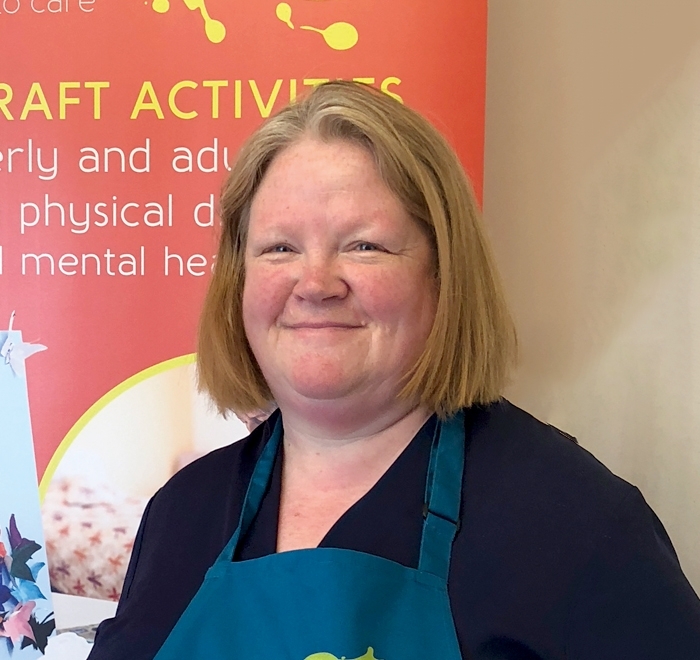 I have had over 10 years experience in the care industry, have qualifications in Health & Social Care, Working with Individuals with a Learning Disability as well as in Mental Health Awareness. I love working with people and to be able to use one of my biggest passions which is art & crafts is something that I feel very privileged to be able to do. I have an up-to-date DBS & am currently undertaking courses in Dementia Awareness & Autism. My background is in art – I studied Illustration for my degree, specialising in mixed media work combining painting, drawing and collage. 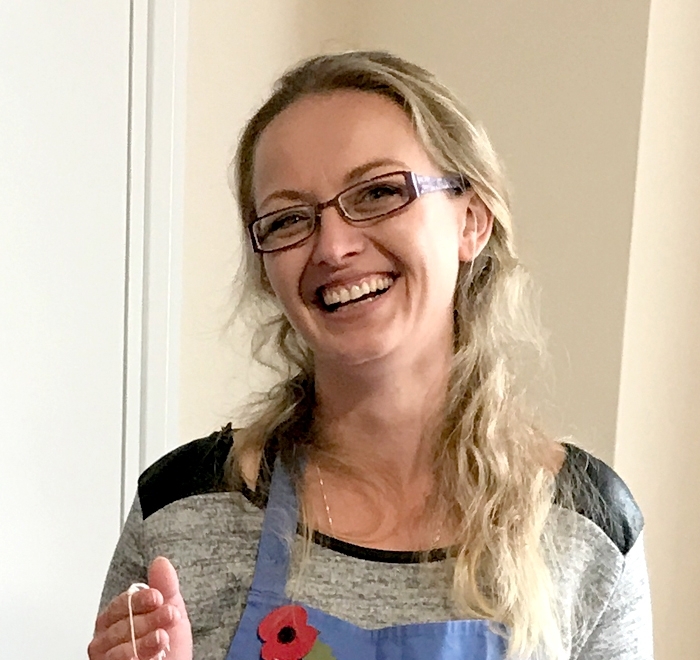 After graduating I started working for my local Community Arts organisation, running art and craft workshops with a diverse range of community groups. I also started running art classes for elderly people in care homes and sheltered housing. 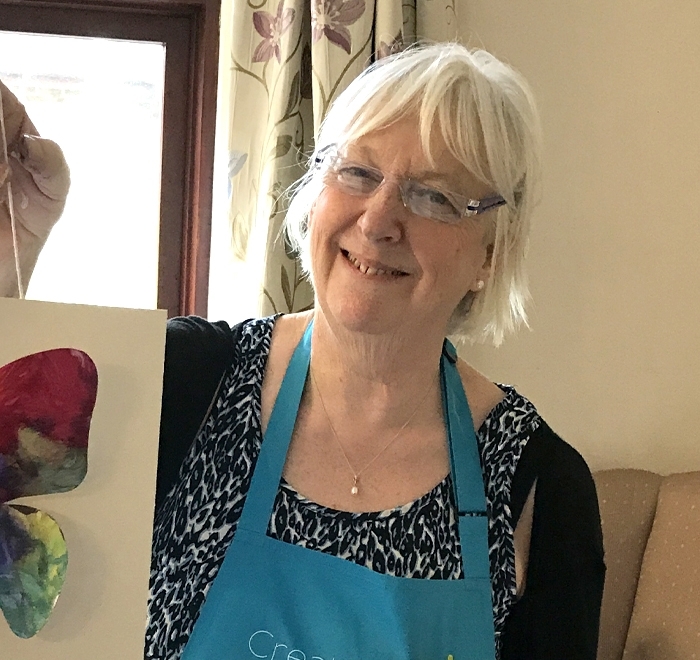 I found this to be a profoundly rewarding experience – I loved building up relationships with residents and helping them find their own creativity and enjoyment, regardless of their previous art experience or their physical and mental abilities. I’ve been raising my young children for the last few years and have enjoyed lots of fun and imaginative art sessions with them! 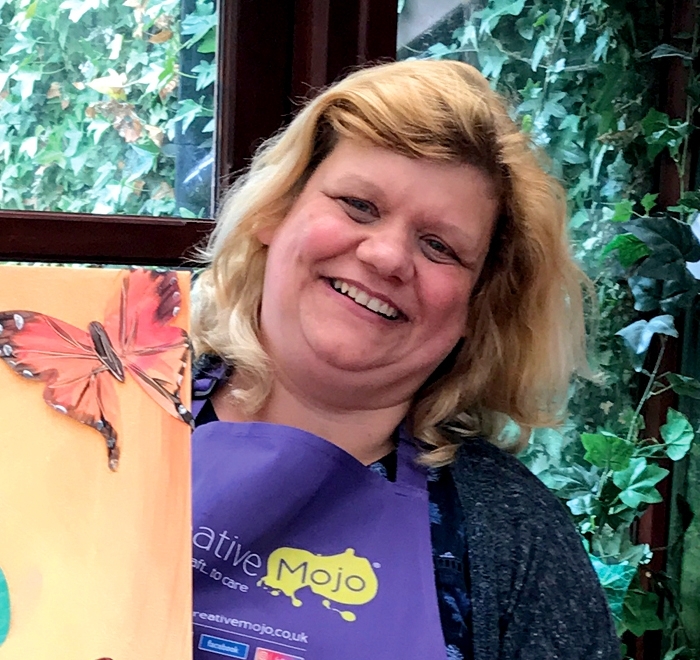 In stepping back into the world of work, I was keen to combine my love of art and creative expression with the desire to do something that directly helped others and so when I learnt about Creative Mojo I jumped at the chance. I firmly believe that art and craft practice can help us be fully mindful and present in the moment, help keep our brains active and interested in the world – and help us relax and have fun too. I have seen the way in which a finished piece of artwork can give the maker great satisfaction and increased confidence. I am currently studying on a Learning Disabilities Awareness course. 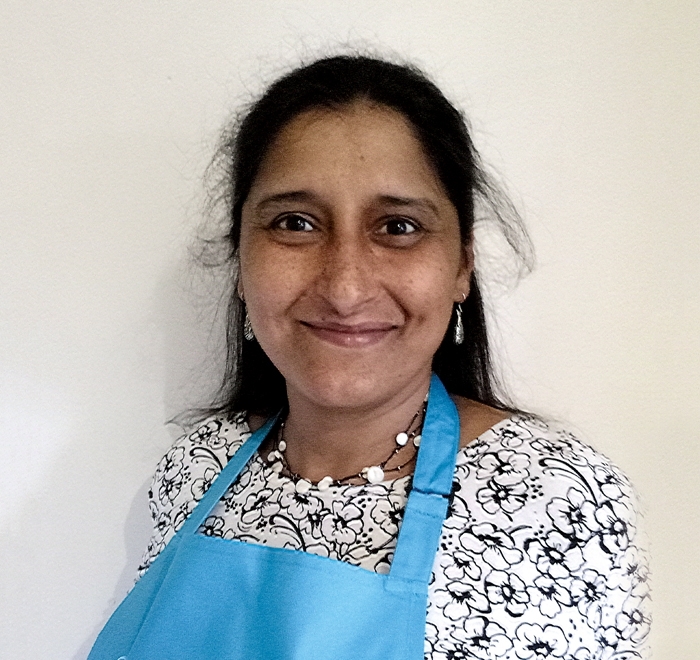 Johann and I have both been in the print design, printing and promotional printing industry for over thirty years before relocating to the U.K. in 2014 and for the past four years Cheryl has been really enjoying working within the care industry. 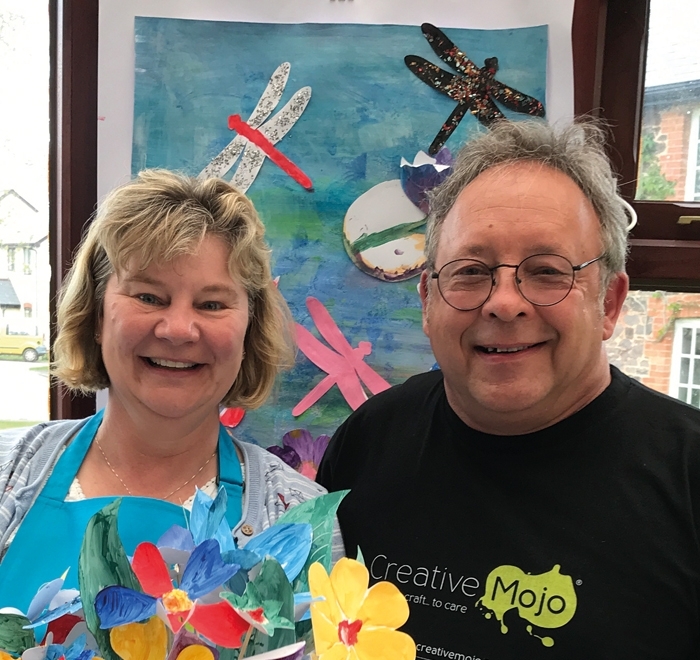 We are both very “out the box” thinking, creative people and so can think of nothing more satisfying than bringing the arts and crafts classes we now provide through Creative Mojo into Residential Care Homes in the Crowthorne, Wokingham and Reading areas. 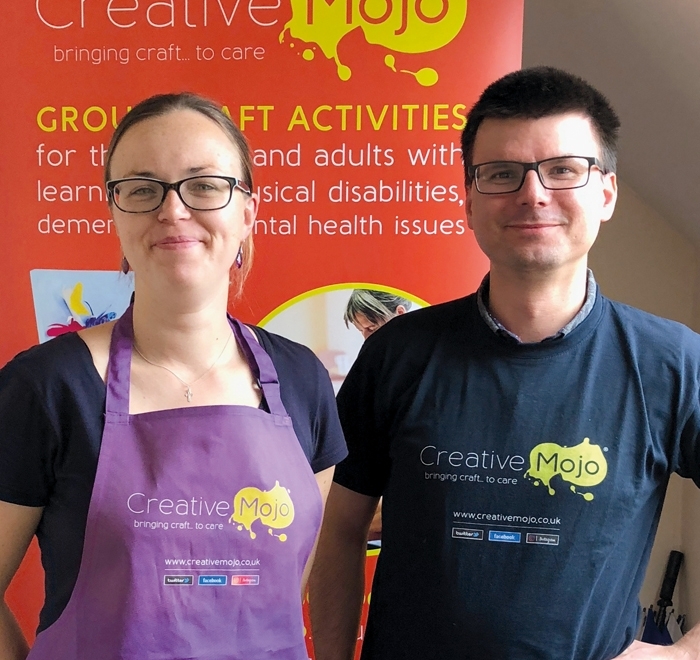 We are very excited to be part of the Creative Mojo family. Over the years I’ve worked in a variety of sectors including dementia, reflexology reiki and slimming world. In my personal life I have experience with Parkinson’s and learning disabilities. Having a job empowering others is incredibly rewarding. A little magic happens in our workshops and I’ll never tire of seeing the delighted faces of our clients when they see the end product of their work. With a background love of arts and crafts, I took the opportunity to a change in career with Creative Mojo. 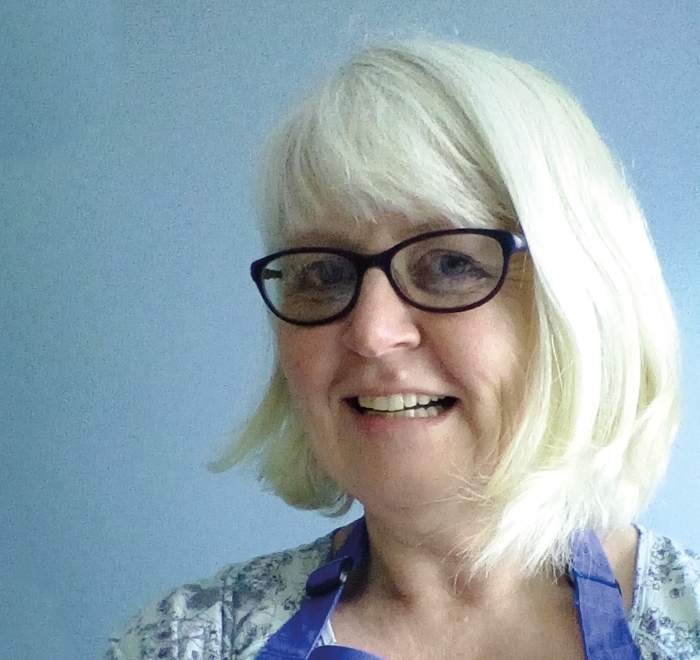 I have a GNVQ in art and design and have completed courses in ceramics, silversmithing and batik and most recently have been enjoying an art course covering pencils, water colours, pastels and acrylics. 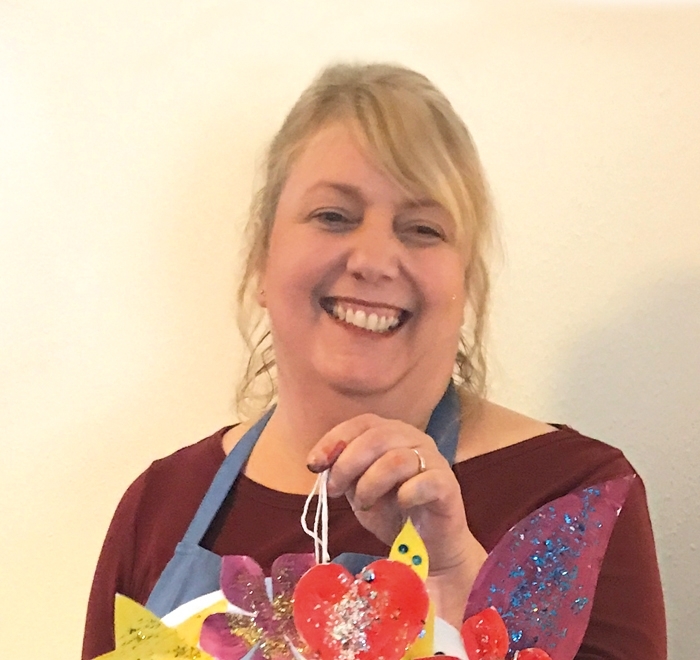 I have always had a compassionate nature, an interest in the wellbeing of others and added to my creative side I always ensure everyone enjoys their craft sessions. I am fully DBS checked and a dementia friend. 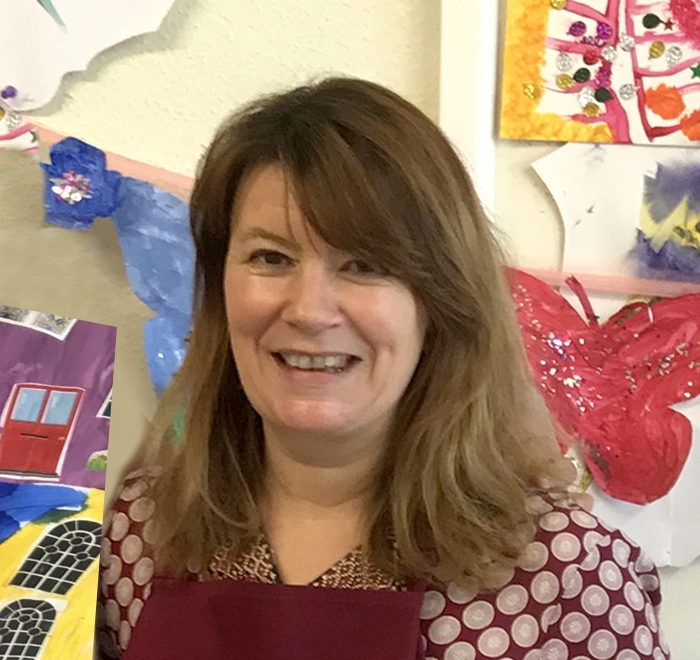 Having been a primary school teacher for 14 years I had lots of experience of art and craft activities but more importantly, I developed patience and the ability to inspire confidence alongside creativity, using simple instructions and step by step projects. I lived in the White Mountains of New Hampshire, USA for 6 years and saw a fresh approach to art in a more community lead and natural way. I have taken courses in Nature Crafts, Folk Art, Rag Rug Making, Garden and Rustic Art and Wreath Making. I love art inspired by the changing seasons and art in the garden as well as indoors. I have completed courses in Basic Sign Language and First Aid and am currently working on a Dementia Awareness course. Natasha has come on board to run the Kingston-Upon-Thames. Her territory covers parts of Epsom, Wimbledon Common, Richmond and Twickenham too. Any local care home managers, give Natasha a call now to book in a class. I’m busy running the Nottingham franchise and with a fantastic care background, can’t wait to get started. Please do give me a call or email me to get a class booked in for your Nottingham based home. My early working life was mainly in business and Finance, however I decided that I should do something a little bit more worth while, so I decided to go into nursing and embarked on my nurse training, a life I loved. A few years later, having started a family with my husband and being a stay at home mum I felt the creative bug again, so began my own furnishing business working from home. 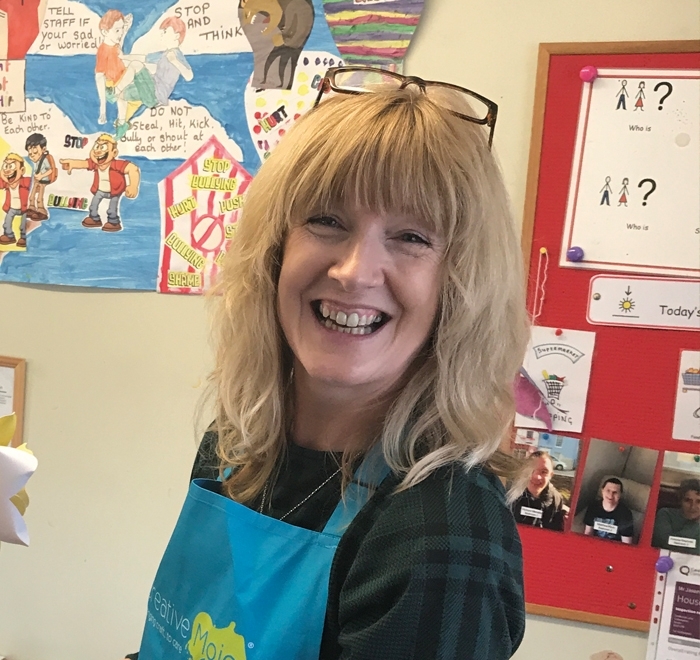 As the children got older I started to feel that I should again have a more worthwhile and fulfilling job working with people, so I became a home carer, a job I really loved. Unfortunately the long hours were not conducive to family life so I began searching for something that would combine my need to have fulfilling employment alongside my creativity. And then one day the opportunity to join Creative Mojo appeared and I can honestly say it is the best decision I have made. Working with such lovely residents and staff. Seeing the look of joy on their faces . Priceless. After attending art college and then university, obtaining qualifications in ceramics, I then became an interior decorator, now 30 years later I feel I’ve found the job I’ve always been looking for, combining my creative skills, patience, cheeriness, understanding and respect of people. I am so happy to be part of Creative Mojo. Knowing I am making a positive difference to residents lives is the best reward ! As we are parents of three children and are constantly busy, we have to use our creative background on daily basis and we really enjoy it. To turn something you love into your job – what better could happen to us!? Born in South Africa I’ve been living in the UK for 16 years, I am now a British citizen. I have always had a passion for art and love sharing that passion. Coming out of the Corporate world, my love of art, charity work and meeting new people led me to Creative Mojo. If I’d been asked to create my dream job, this would be it. Bringing arts & crafts to care home residents & people with learning disabilities I work with is a pleasure. The participation, engagement and especially the sense of achievement at the end of each class is fulfilling and lovely to be part of. I have over 10 years experience working with adults and children with learning difficulties. My reason for setting up creative mojo was because of a love for this work, the art side of things was a bonus! I strive to get to know the residents I work with as individuals and relish in the challenge of adapting my sessions accordingly so they are accessible to all. Giving everyone a chance to create something, no matter their ability. Feedback from regular clients is that residents who are usually disengaged with social activities have taken part with enthusiasm in my sessions. I believe this is due to my personable and amiable manner. 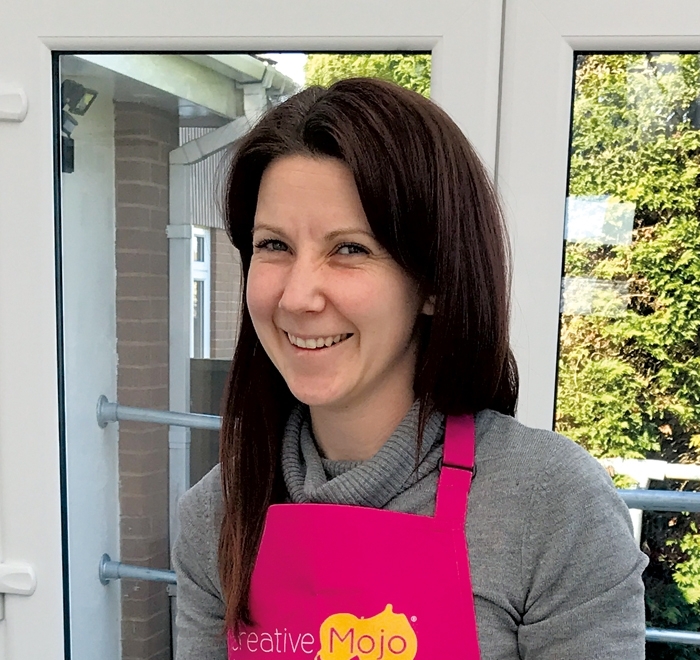 Sam joined the Creative Mojo family in April 2018 and runs the territory covering Milton Keynes, Leighton Buzzard and parts of Bedford. Enthusiasm personified, care homes in the area, give her a call! 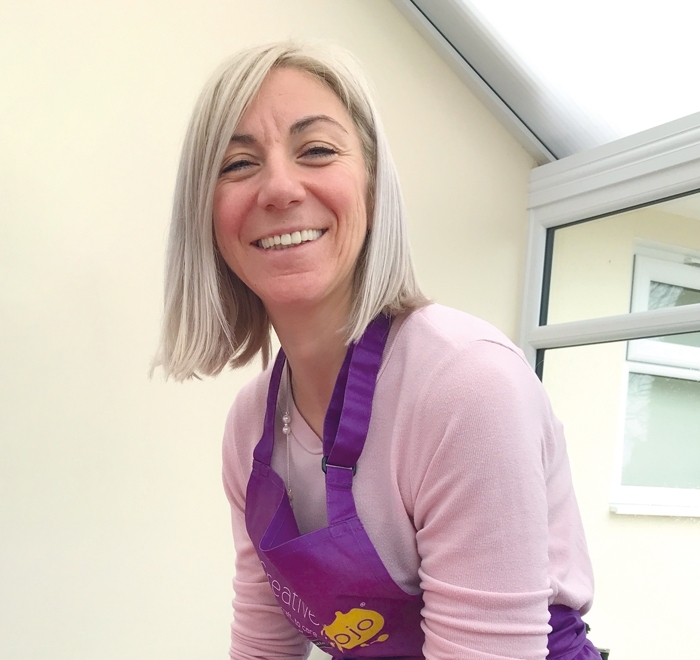 Dawn runs the East Cardiff franchise and is our first franchisee in Wales. Dawn came on board in early February 2018. I’ve worked in the care sector for many years, and it’s work that I enjoy, but I was looking for a challenge, to meet new people and broaden my horizon. I must say it is the best decision I have ever made. 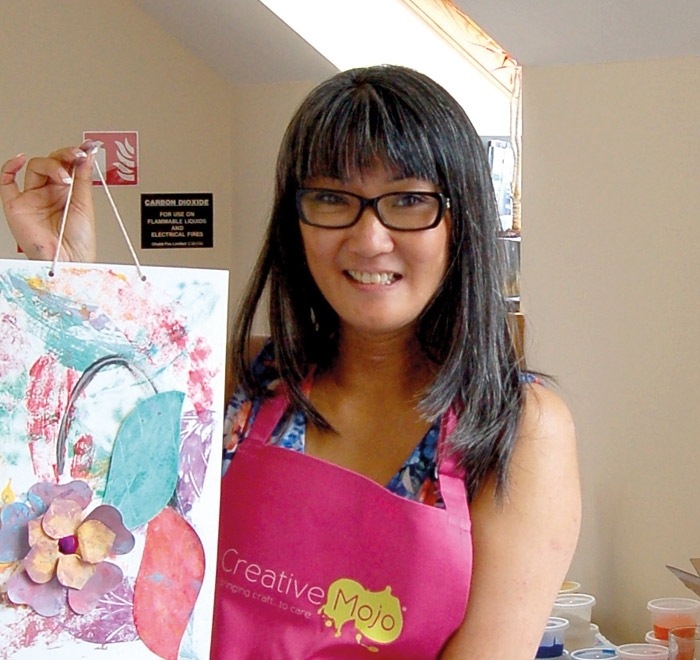 I love being creative and didn’t realise my artistic flair until I began with Creative Mojo! One of the best parts is when an individual says they can’t do something, then their face when they see what they have achieved is just fantastic. I love spending my time with the residents, interacting with them, and seeing everyone having fun and being creative. It is so rewarding seeing how their faces light up when they see the finished project, and how they can’t believe they created something so wonderful. The great thing about Creative Mojo is it is suitable for every ability so everyone can get involved. The main reason I chose this business is the impact it makes on residents, it makes people so happy to get messy and have some fun. It’s a very contagious feeling! Plus it fits brilliantly around my family. Creative Mojo gave me the opportunity to combine my professional experience with my passion for art and design. I trained as a mental health nurse working in a day hospital with people over the age of 65 and then as an Early Stage Link Worker with Alzheimer Scotland. I am also a volunteer speaker for Playlist for Life a music and dementia charity which has pioneered the use of personalised playlists for people with dementia. My other creative outlet is as a volunteer artist for a charity which customises Converse trainers for children with cancer. I’m loving my new career with Creative Mojo and in the relatively short time since I started am finding it a really rewarding way to work with a wide variety of people. There is increasing recognition of the therapeutic power of the arts and I feel very privileged to be involved in that. supporting them to create arts and crafts pieces which they truly feel ownership over. 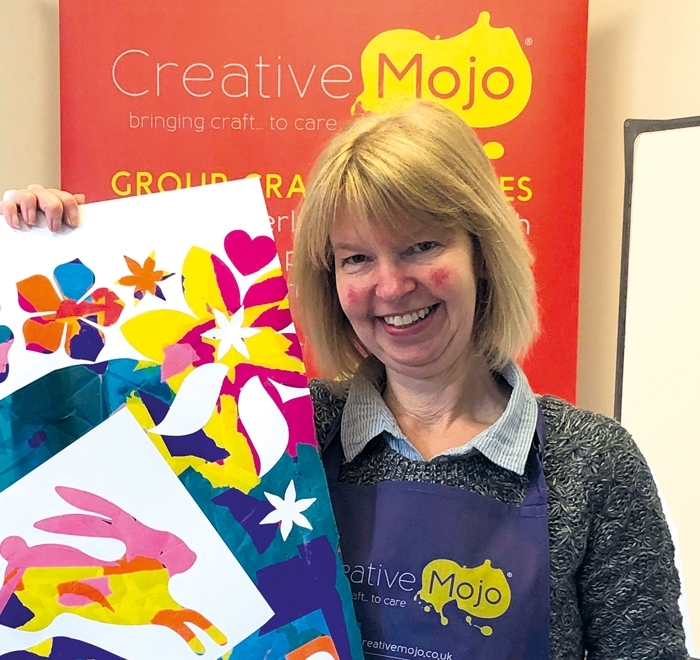 Facilitating Creative Mojo sessions is deeply satisfying as activities themed around seasons, festivals, community events and participants’ own interests generates excited engagement with the process and brings people together. The best part of any session are the claps, the smiles and looks of pride on everyone’s faces at the finished pieces. I’ve always been a creative person including sewing, paper crafts, card making and scrapbooking. I loved the idea of joining Creative Mojo as being a people person, I get to share that creativity with others. I find it a very rewarding career. 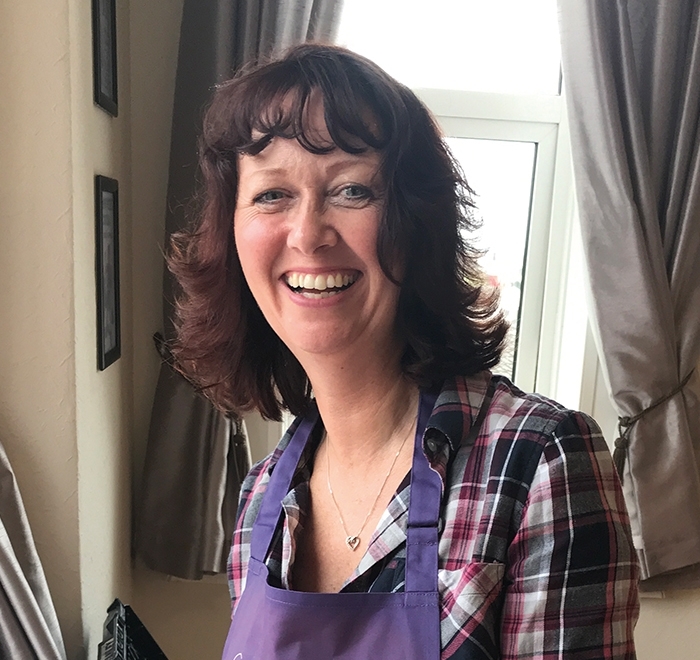 Deborah, having grown up in a household where ‘the arts’ were very much encouraged, she has always had a passion for anything creative. Her early career was in the field of architectural design, which then followed on with interior and landscape design (as well as producing her own art and crafts projects over the years, including drawing, painting, ceramics, creative textiles and computer graphics/illustration). Following the arrival of her three (now grown up) children, her interests also expanded into working within the realm of education – and over the years, having had specialist training, she has supported numerous 4 to 19 year olds, with various special educational needs, severe learning difficulties and complex health needs; as well as mainstream students who were out of school due to ill health. 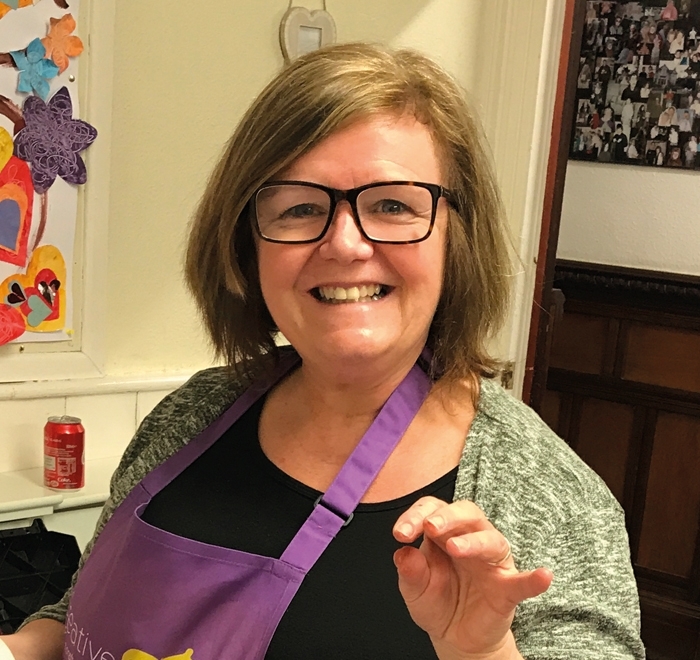 Deborah loved being able to use her creative skills, in various ways, to engage with these young people and help ‘enrich’ their life experiences. She also, along the way, was involved with a well know charity for the elderly in the UK, supporting clients by looking after their gardens, which helped towards enabling them to stay that little bit longer in their own homes; a most rewarding and enjoyable experience too. Glenda, was born and raised in the vibrant country of South Africa, where she enjoyed anything to do with art and craft from a young age. 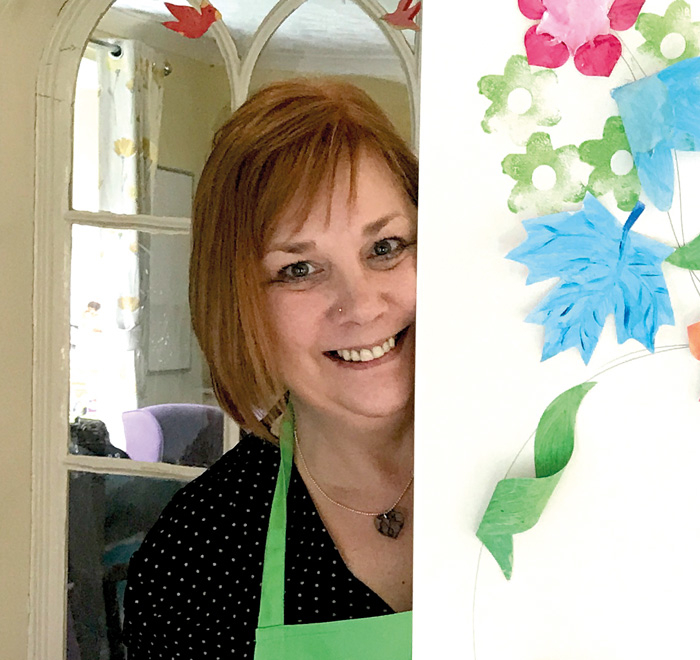 Having worked in an office environment in her early career, where she developed her business skills, she came to realise that her desire to use her love of creativity would find itself in a different work environment all together. 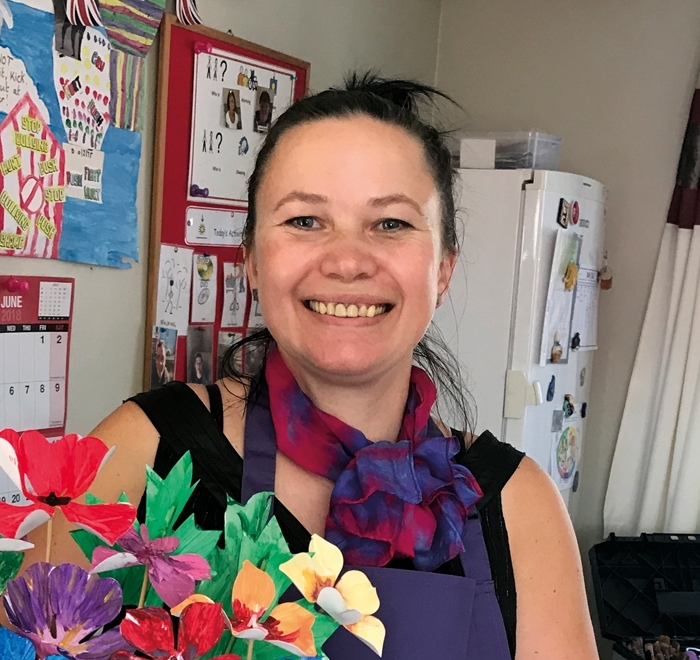 Glenda then trained in Nursery and Pre-School education, where her caring nature and natural ability to engage with people was fully realised. Glenda also has two grown up children and, whilst they were still young, moved with the family to the UK. 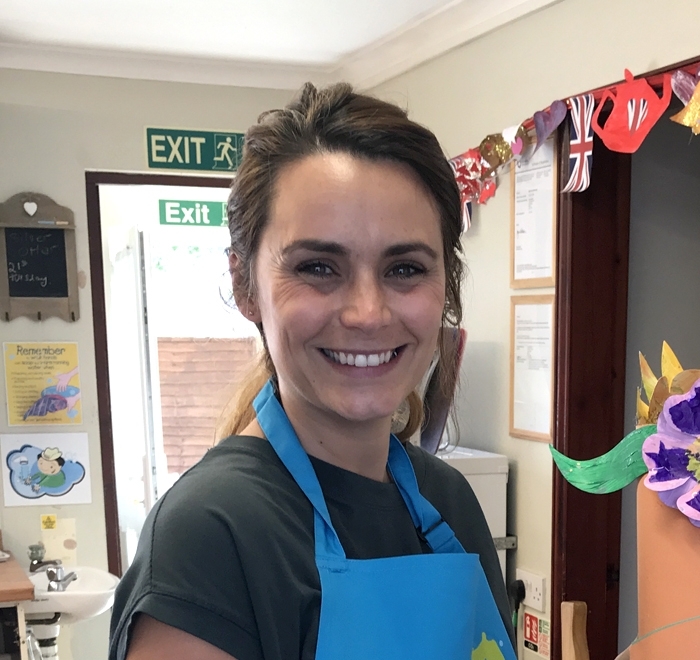 She has continued working in nursery school education over the years and her natural talents and strength in the ‘creative activities’ has given her lots of opportunity to develop the art and craft side to her work, as well as her own interests in anything creative at home. 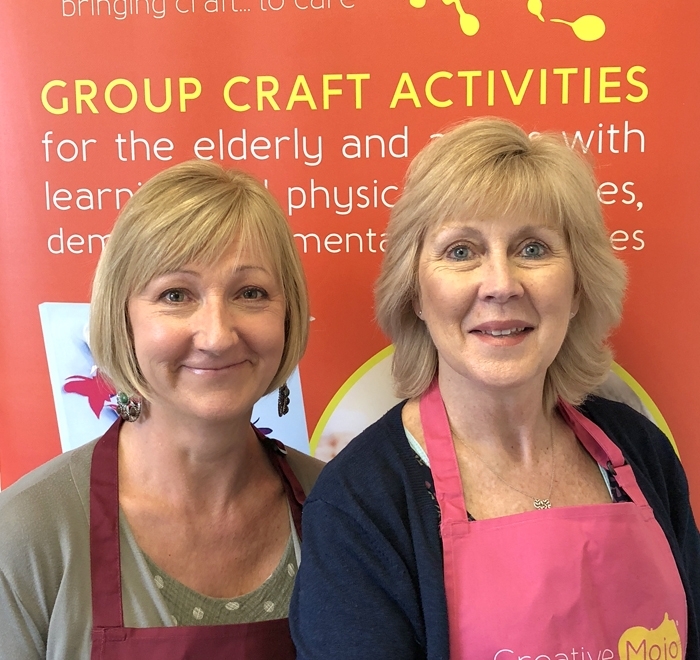 Earlier in 2018, whilst looking for a slight ‘change in direction’, both Glenda and Deborah, as close friends, were thrilled to bits to be given the opportunity to join the CM team and to be able to draw on their uniquely ‘combined set’ of skills and experiences, to work together as co-owners of the Warwick and District Franchise. 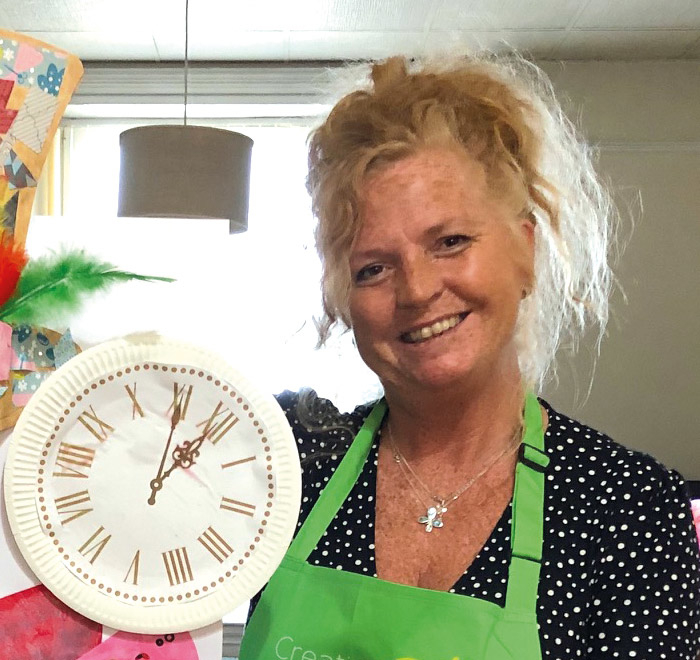 Delivering art and craft sessions often as a ‘duo’ and sometimes individually, they bring a touch of fun and enthusiasm, as well as a caring, person-focussed and thoughtful approach to their work. What a first year I’ve had. I have to say it’s one of the best things I’ve done in my life. I never have that Monday morning feeling and most days I come home smiling to think I’ve brightened up someone’s day and I can continue to do so. My experience up to this point is quite varied. 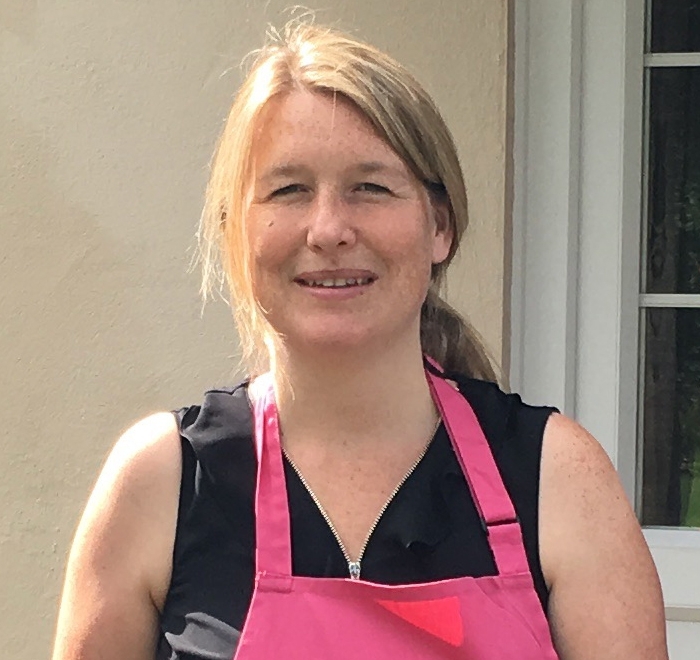 I have worked for myself on and off, I was a manager and partner in a white goods retail and repair shop, I owned and ran a B and B, I managed and owned a retail business single-handed for 3 years, I was a project manager overseeing flat conversions. I have also been employed, I worked in the community as a carer for the elderly, I was a support worker for young people with learning disabilities and challenging behaviour. I also cared for my mum when she had dementia, which was a very challenging experience, so I’ve seen this illness very close up. I am a very proud mother to two children, who have now grown up and leading their own successful lives. This job rolls everything I’ve experienced into one amazing career. In my spare time my hobby is still art, I do acrylic pours and it’s brilliant for de-stressing and I really enjoy it. 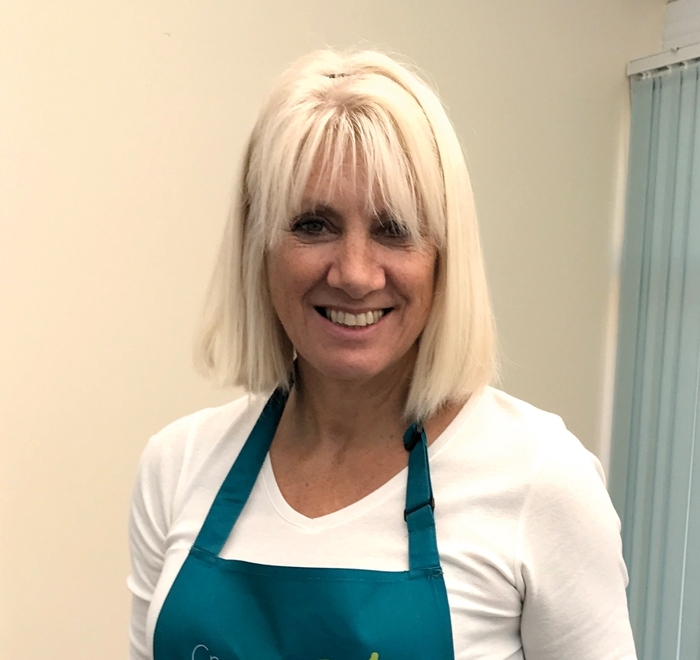 As for training, I have previously taken emergency first aid, food hygiene, safeguarding vulnerable adults and young people, dementia awareness, managing challenging behaviour and de-escalation training, I also hold an NVQ 3 in Children and Young People’s Workforce. This is an amazing opportunity to be doing something I really enjoy and love. After my Fine Arts degree, specialising in printmaking, I trained as a teacher and over the 20 years of being in education I have worked in both mainstream and specialist schools where I have worked with a huge range of ages and abilities including physical disabilities and young people with profound learning disabilities. It is so rewarding and encouraging to see people being brave and having ago, I am there every step of the way to fully support, inspire and encourage; everyone is welcome to join in or watch the sessions the experience is so fulfilling for all. I am very passionate that residents work is their own work and I love how the projects are carefully designed to be inclusive so that anyone of any ability can join in. I tweak them on site of course to take into consideration the class size and ability. It usually starts with people saying they are not at all artistic, little do they know. Those who can and are able, are encouraged to work on more detail. Many residents just want to experiment with the colours and learn new techniques as many won’t have held a paintbrush for some years. The teaching side and coaching is such fun and rewarding. I encourage everyone to take part no matter how small a part. Its satisfying when you have a resident who declines to part take initially, I ask them to come sit watch or chat with me. Curiosity gets the better of them and the next minute they find themselves joining in. I try also to include some meaningful activity, though at most of my Homes I do have residents come meet me at the car to collect my trolley and art materials and/or help set up the table and clear up afterwards. Some other residents will need more help than others. Especially those with more profound disabilities, that’s when staff and I support with hand over hand or completing work under instruction, that’s if they are able to instruct. Whatever the ability or disability it’s hard not feel over the moon to see how their faces light up when they see the progress of on-going projects and the finished project. I have always loved anything Arts & Craft related. I trained as a Chef, qualified and worked as one for 5 years. Then decided to start my own cake business on the side(which allowed me to share my creative flare & baking) whilst still having my full time job as a Logistics & Supply Chain manager in a Warehouse. I am qualified as a Chef, Baker, Logistics & Supply Chain Manager, SAP programming & trainer. 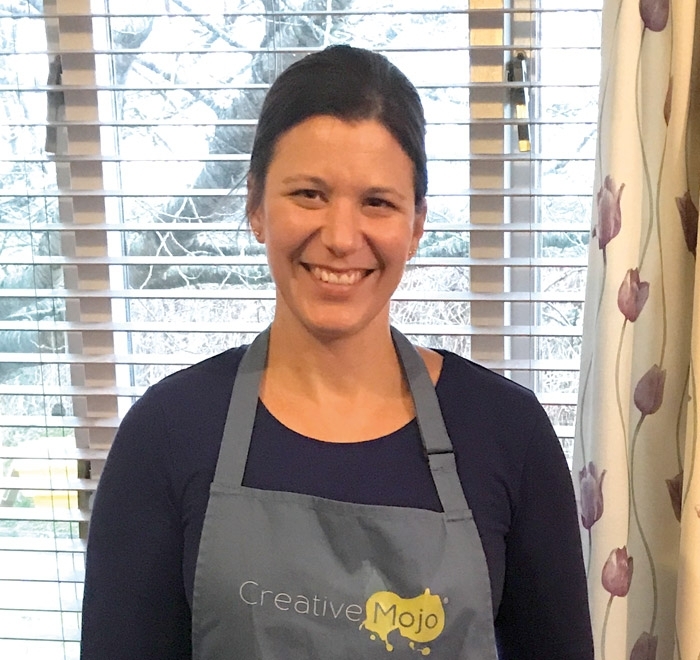 Joining the Creative Mojo Franchise was a dream come true for me as I have always enjoyed helping people, being creative & sociable. Now I get to live my dream daily & meet new people. Seeing the creativity come through in all my dementia & learning disability clients amazes me daily, and I feel truly blessed to be able to share some special time with these people. I am a qualified primary school teacher and have taught in both mainstream and specialist schools. I have worked in a variety of care roles with people with physical disabilities and those with profound and multiple learning disabilities. I am also a carer for my adult son who has Down’s syndrome and autism. 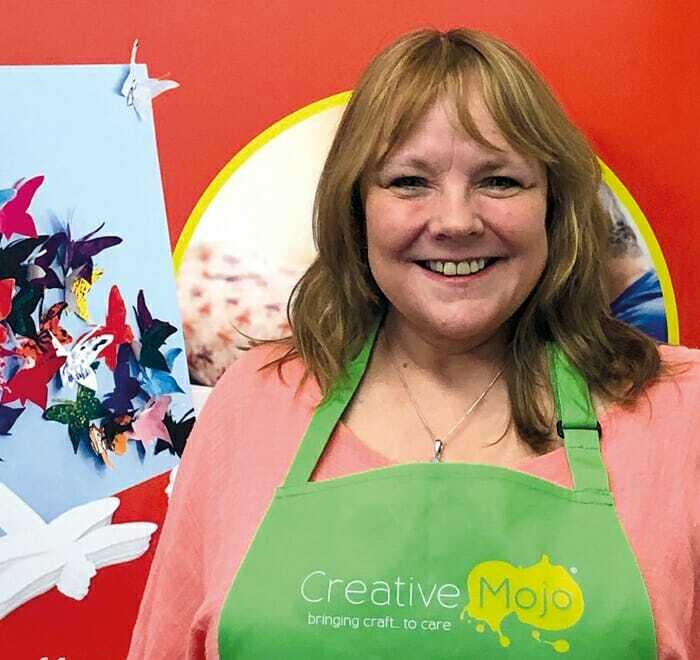 Before becoming a franchisee for Creative Mojo I was a co-ordinator of a small charity that offered training and practical support to parent carers. Unfortunately I was made redundant when the charity closed and I never thought I’d find another job that I loved quite as much. Creative Mojo is perfect for me and allows me to incorporate my previous work experience with my love of being creative. I feel privileged to be able to help a variety of people create art and have fun. The satisfaction I get from seeing the joy on people’s faces when they see what they have created is priceless. My passion for arts and crafts has led me to help others explore the joys of creativity. Working in India creating bespoke craft boxes for cultural events has given me a wide knowledge of crafting and design, which I bring to my work. My experience in working with people with profound and multiple learning disabilities helps me encourage my class explore their freedom to chose colours, materials, patterns and shapes. We all love seeing the art work framed and hanging on the wall. All projects are seasonal and event themed, relaxing music works really well in my classes too. Some residents say ”we will be waiting for you next week.” And that is music to my ears, we all feel over the moon with the finished art work. HAPPY PAINTING AND KEEP SMILING. For many years I worked in local government. 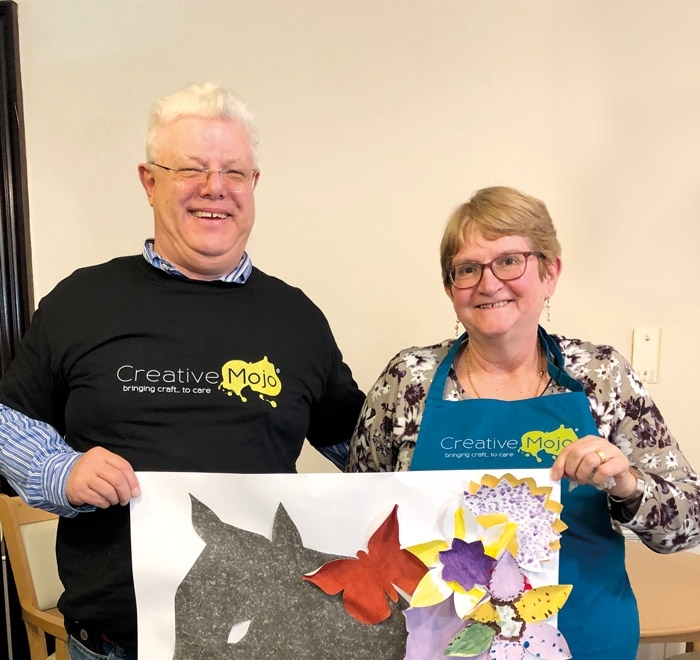 After my husband was diagnosed with dementia I realised that I wanted to help bring some happiness into the lives of adults who face an uncertain future. Creative Mojo is the perfect way to reach these people. Art unites us all. We chat, laugh, sing and together create something that brings joy to even more people when they see our art. 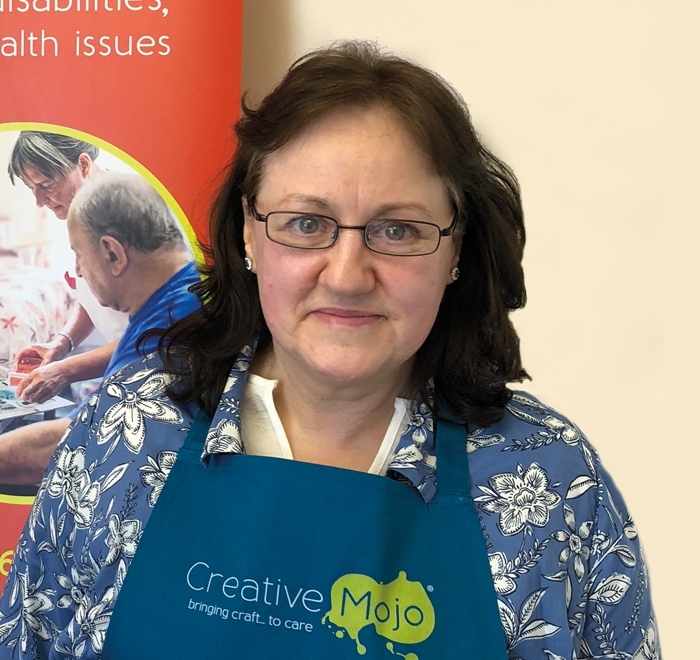 I worked as s Housing for 15 years but wanted to work more directly with the elderly or people with learning disabilities, at Creative Mojo , I have combined the two! I love working on the different themes and I am also very interested in how the themes stimulate the memories, i often get a lovely story with a piece of art work! It is a very rewarding job to see people develop in confidence and enjoy what they are doing. It certainly keeps my Mojo alive! Having nursed for 40 years,and used painting and art in that role without giving it much thought…I finally realised how healing creativity is. This led me to use art working with refugees in Sudan, and Iraq…studying PTSD and the incredible ability of our creativity to bypass the mind and reach the heart, where healing is so needed, bringing peace to troubled people. The mind reasons all sorts of good ideas for not being creative, especially a generation taught to stay within the lines and do what the teacher said, squashing so many creative people, with the idea “Im no good at that “. Me too, it took a lifetime to re-discover my love of art and colour. So, helping the elderly, or those with mental health challenges, to be free, and explore their creative streak, is so rewarding, and so much fun, as we laugh together over our attempts to “be perfect “. 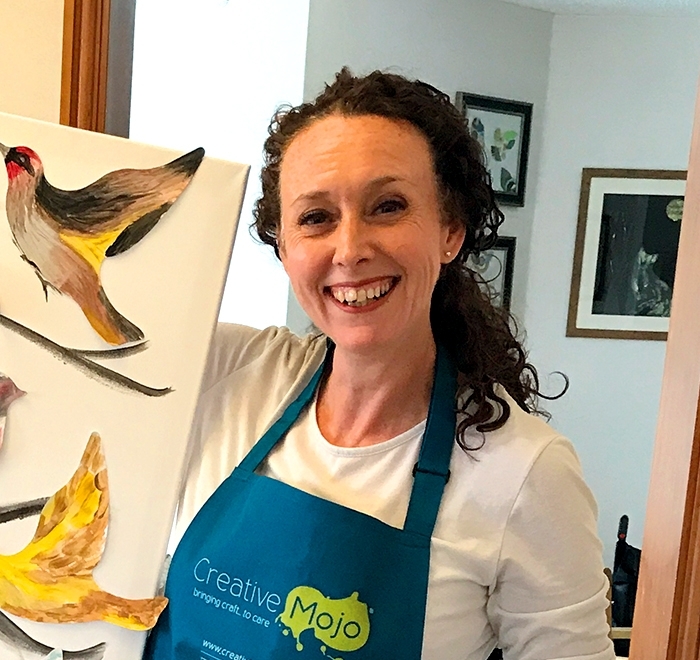 Creative Mojo has been wonderful for me, to get to know the residents of different homes, and the staff, and form relationships with cups of coffee and paint strewn everywhere ! And always astonished at the amazing results…no two people do the same thing. I am now stepping out into Day centres to do the same. 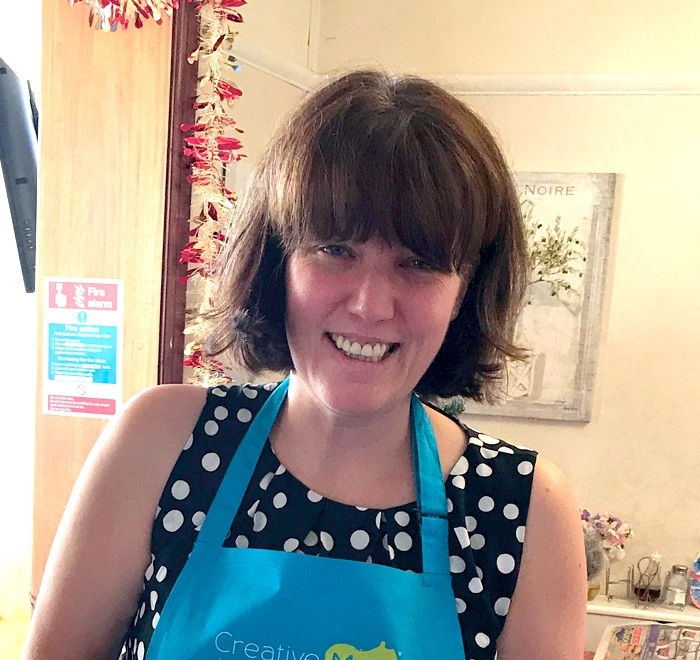 Having worked in secondary education for many years, I was in search of a new challenge – a chance to run my own business, to be creative and make a positive contribution in some way. Creative Mojo provided the answer. I count myself incredibly privileged to have found something so rewarding, whilst bringing a little joy into others’ lives. I would like to thank the West Cardiff caring community for your ongoing support and positive feedback. I look forward to working ever closer with you in the years ahead. 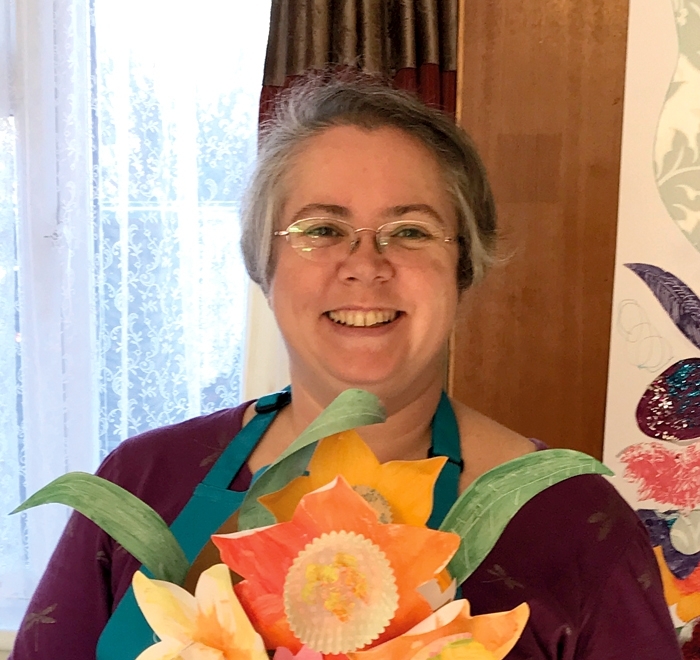 I have a very diverse creative background, from taking Art at higher level in high school through to decoupaging, beading, papercrafting, jewellery making and stained art experience. In addition to being a qualified seamstress/dress designer and swim teacher (my son has swum at the Olympics, although I will only take a little bit of credit for that…), I spent a number of years as a full-time carer for elderly and/or dementia patients around Europe. Max and I both have previous art and design experience, Max also comes from a customer service background and I have for many years worked with Riding for the Disabled (RDA), so working as a Creative Mojo’er seemed a really good fit. 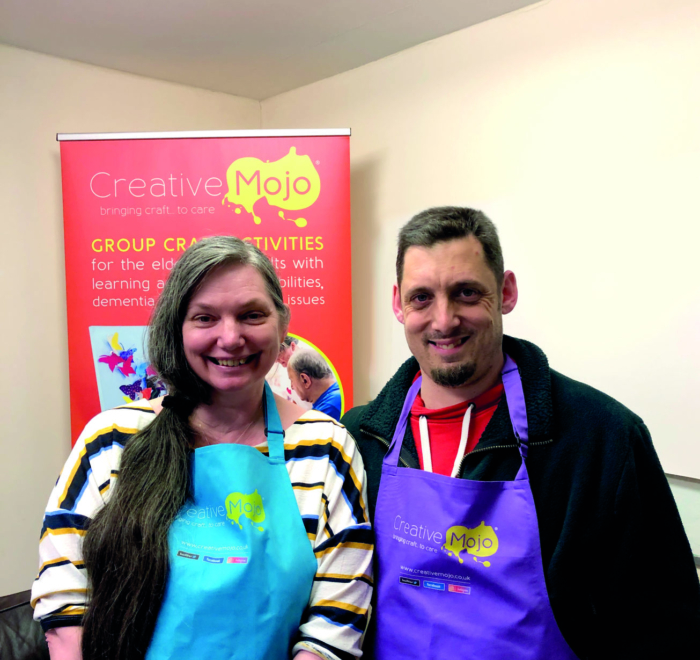 We started Creative Mojo Coventry & Nuneaton in May 2018 and the business is growing steadily, developing our ideas and meeting new homes on a weekly basis. We were thrilled last month when a local trust awarded us our first double weekly booking, across two learning disability homes, on a yearly contract. And we have been receiving some tremendous reviews from both dementia / elderly care and learning disability homes in our area. It is so rewarding working with the residents and their carers and to see the fabulous artwork that they produce. Everyday and every project is so very different, even the least able feel they can contribute to the projects, which often find pride of place on the walls and in the reception area of the homes and day care centres. I’ve enjoyed crafting as a hobby and then as a small business for fifteen years while raising my two daughters. 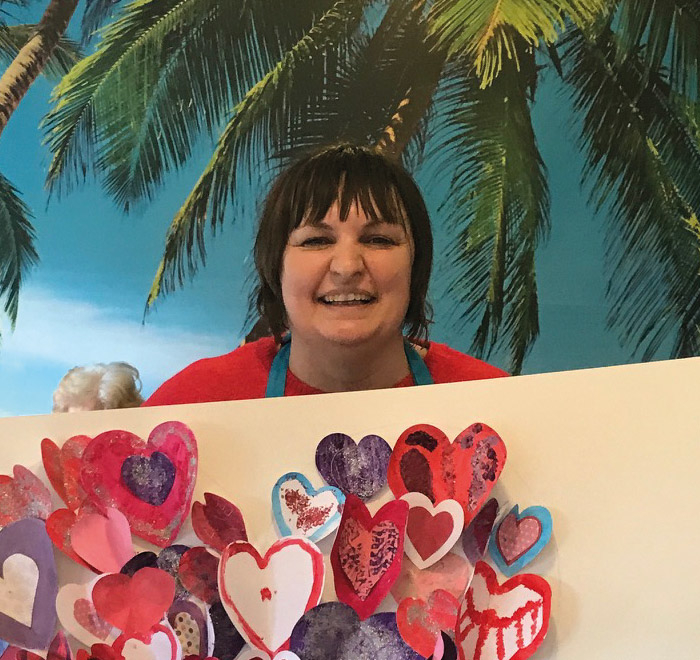 Now it’s time for something new – combining love of crafting with experience as a youth leader and as an adult volunteer with a first aid charity, crewing boat trips and helping with activities and trips at a local Country Park. 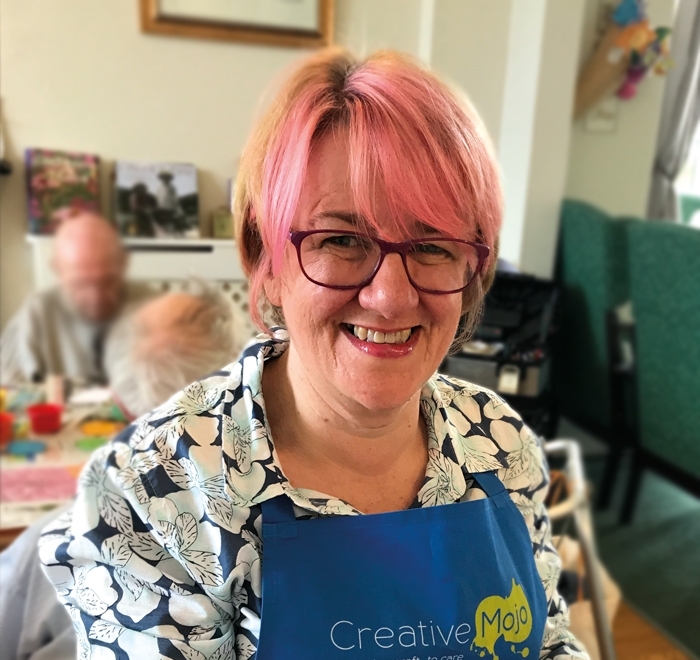 Already qualified to teach adults, since joining Creative Mojo, I’ve also learned more about the arts and dementia through UCL and plan to continue studying, so that I can make my workshops as inclusive and accessible as possible. 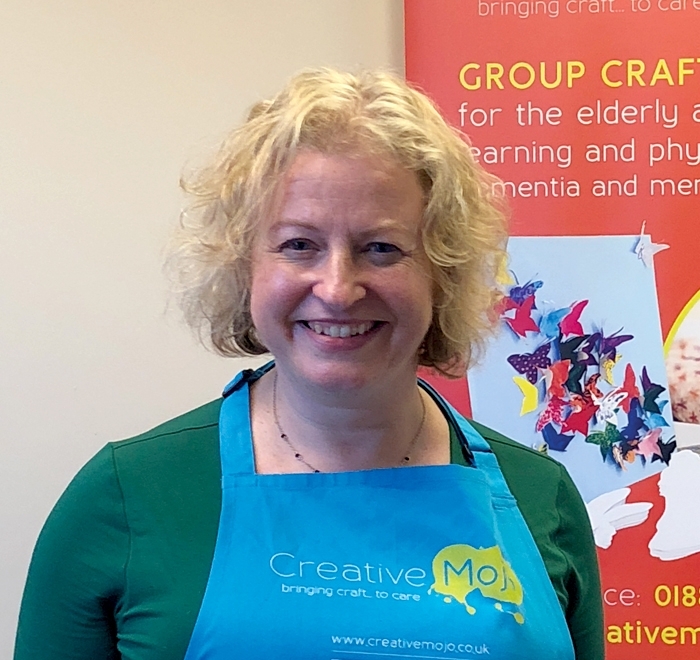 I feel privileged to meet and bring craft to so many amazing people – it’s the residents, carers and managers who make this role such a richly rewarding one! After 20 years of working in an office, I decided I needed a new challenge doing something I enjoyed and that made a difference to other people’s lives, whilst still giving me the flexibility to raise a family. The Creative Mojo franchise ticked all the boxes. The support I’ve received has been fantastic. I love being my own boss, the variety and most of all meeting wonderful people along the way ………I haven’t looked back. The best way to describe being part of the Creative Mojo family, is that it ‘feels’ right. I used to care for my beloved grandfather whilst having dementia and being able to combine both my artistic passion and caring personality is truly a dream come true. 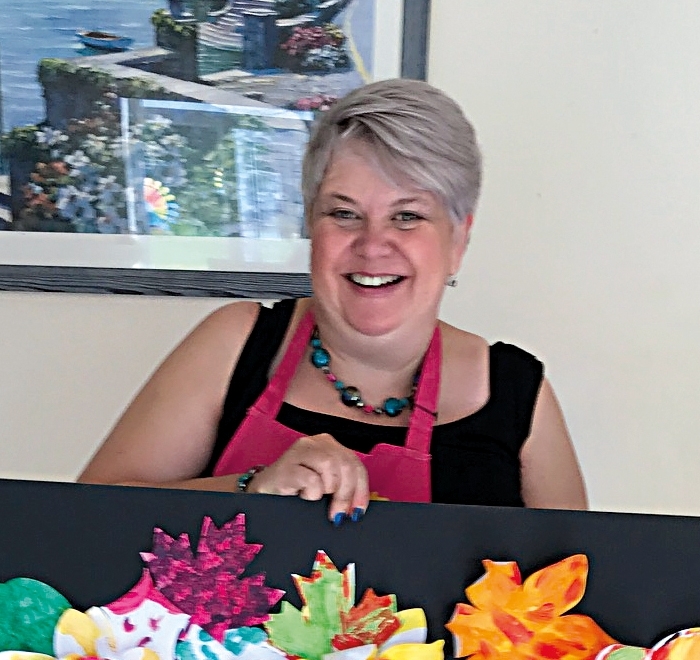 As an artist, colour has always been my passion and continues to underpin my work in both two and three dimensions; in painting and mixed media work, stained glass and jewellery. I wanted to work part-time after my baby was born and still stay within the creative world. I was running a successful small business selling sewing kits and jewellery to museums, gift shops and art galleries all around Britain. Needless to say it was hard to give up but impossible to keep going with a tiny baby in tow. I read English at University of Aberdeen and discovered that I have a vocation for teaching. Armed with an M. A. In English, I travelled and worked around Europe for more than ten years as an English language teacher. Living mostly in Italy was truly inspirational and made me want to get back to my roots and start designing and creating gifts for others to enjoy. I love to make things that make people smile. Being a Creative Mojo teacher can be challenging but ever so rewarding. No two days are the same, you can pick your own hours and choose when and how you work. It really fits in with my lifestyle at the moment and helps me stay creative throughout the week. Encouraging others to be creative helps to spread more joy about the world and that is something that I am truly grateful for. I live in Sheffield with my husband Steve, and have 3 grown children. 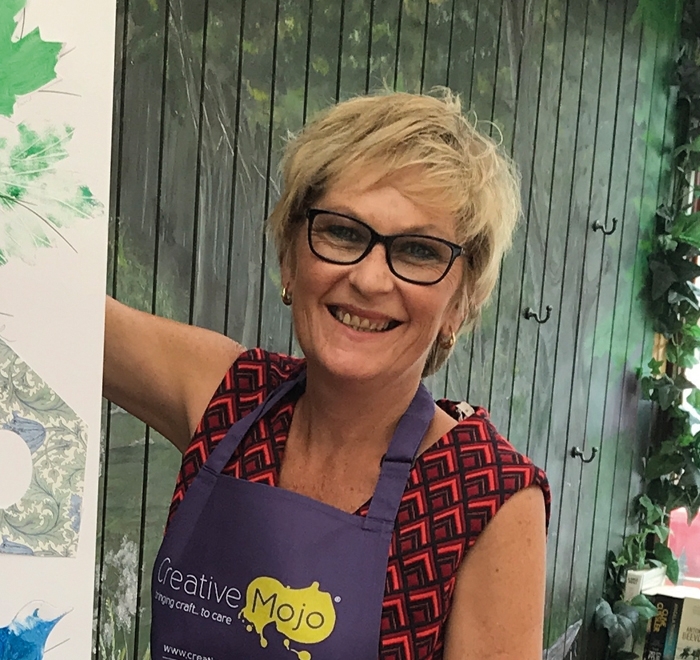 After leaving a 20 year teaching career, I discovered Creative Mojo and have felt both excited and privileged to become a franchise partner!! benefits are well documented! I work with some amazing people – we strive to compliment the important work of activity co-ordinators and other staff, working hand in hand to stimulate residents with a whole range of different projects. The residents are amazing, often chatting, singing, laughing and being creative in a non pressurised way that accommodates their individual needs. And the look on their faces when their completed art work comes together is priceless! This gives me a huge amount of satisfaction, with new care homes signing up every week, I am always looking forward to meeting many more lovely people. 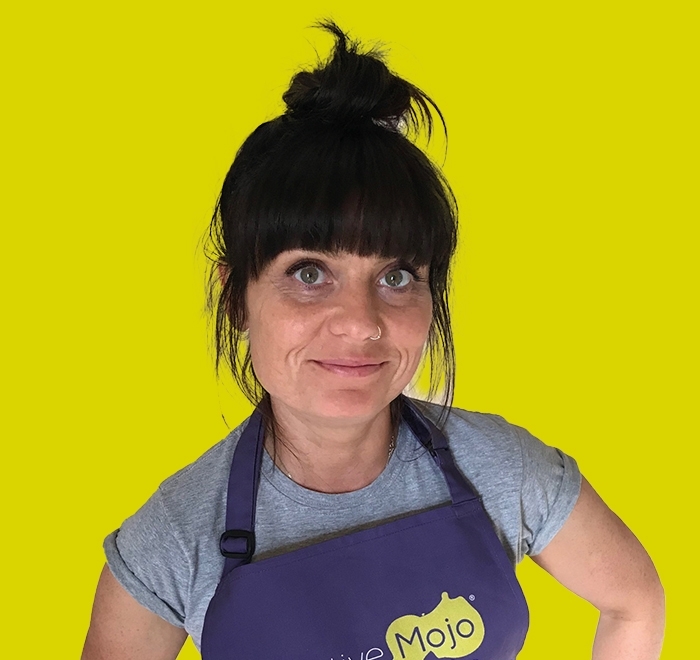 South Leicester began in July 2018, and business has been growing steadily thanks to all the positive feedback and referrals I gain as a result of people who experience classes and wish to share the ‘Mojo’ experience. I particularly enjoy the challenges of taking on new ideas and suggestions and the fact that every session delivered is relevant and tailored to the needs of every class, but most importantly, it is also delivered with lots of smiles. I am always open and receptive to new artistic techniques and materials and I get inspiration predominantly from the environment, both from nature and travel, popular culture and the people I meet along the way. I am actively involved in the arts wherever possible due to my love of all genres of music and performance and a massive animal lover, always open to suggestions of a new vegan dish. Any spare time is spent practising Prana Vashya Yoga or fulfilling commissions through my embroidery label, debbiedoesdenimagain, where I recycle and reuse denim sourced only from the UK. 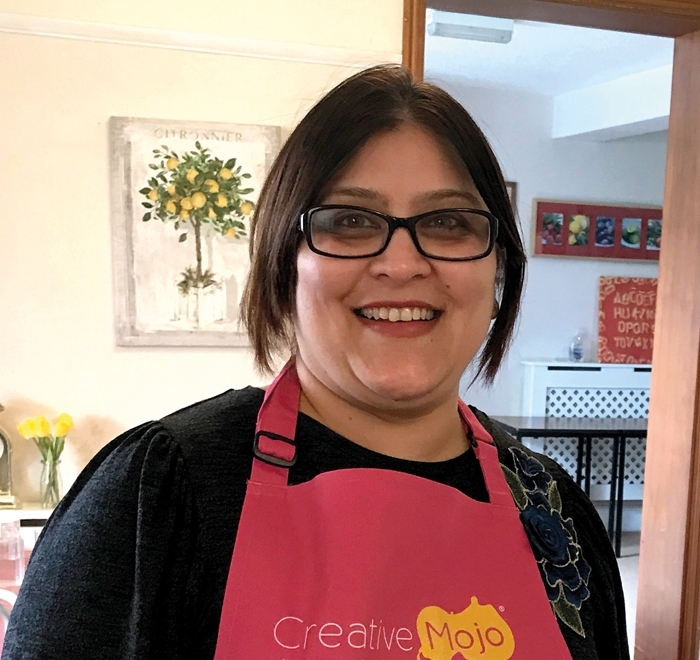 My Creative Mojo franchise in South Leicester enables me to integrate both my professional and personal skillset and opens up opportunities to work alongside some wonderfully creative people. 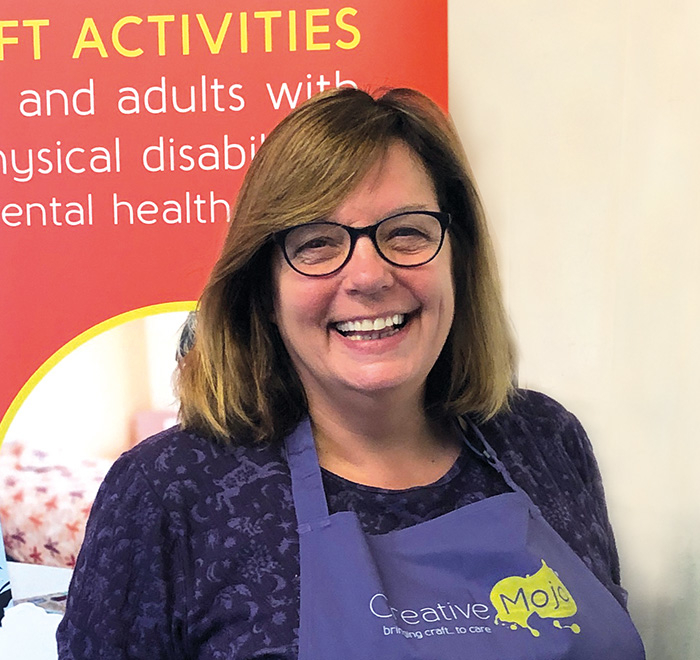 As a result of working within the SpLD and disability sector for over 15 years, together with my natural interest for anything within the creative arena, taking ownership of the local Creative Mojo franchise was an obvious and natural progression for me. After being a teacher for 20 years I needed to have a flexible job that allowed me more time with my children but also allowed me to use the skills I had built up over the years. 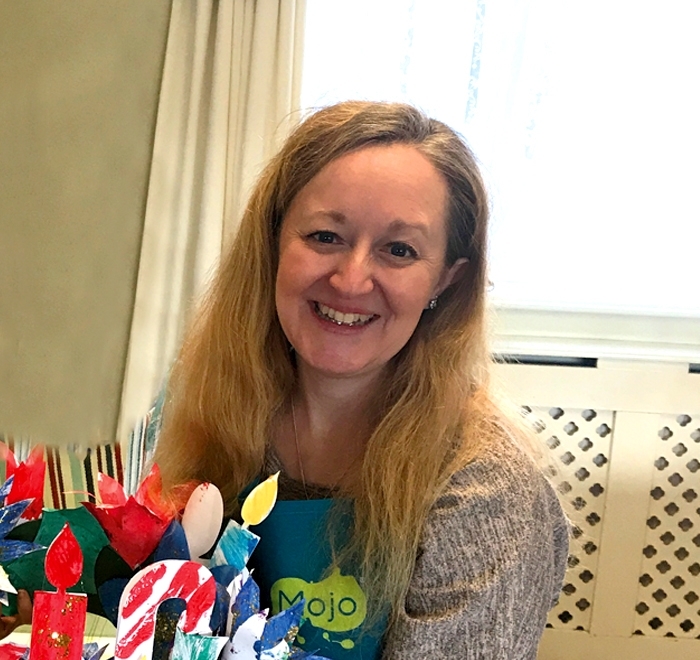 I am so glad I found Creative Mojo – its a job where I can use my skills whilst the children are at school, be arty and messy and meet lots of lovely people. My son (7) summed it up by saying ‘I love your new job because you’re helping people paint and they are not missing out anymore, and it makes you happy’ Says it all really! 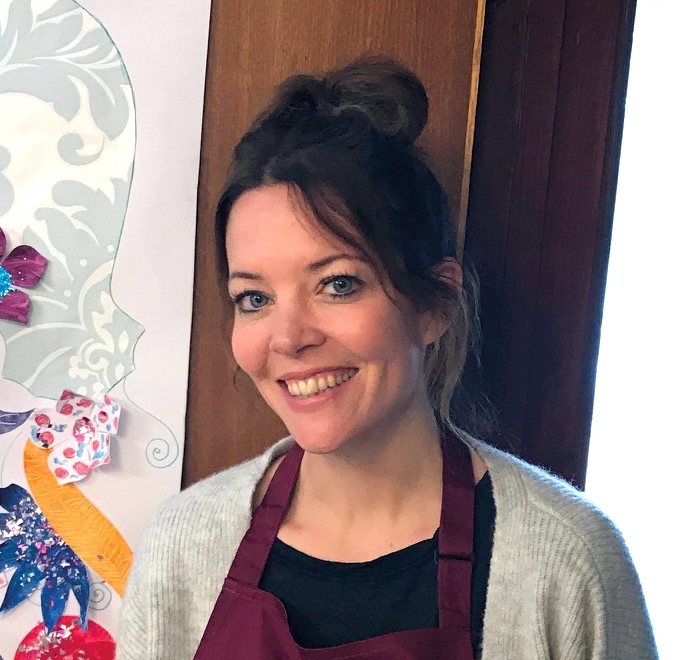 I have always been very creative in nature, making gifts and cards for family from all sorts of things as a very young girl, through to studying Art & Design at College and specialising in Textile Design. Having had few opportunities to really express this side of me during my previous working career in Media and an unexpected redundancy, it got me thinking about what I’d most enjoy doing in the future. 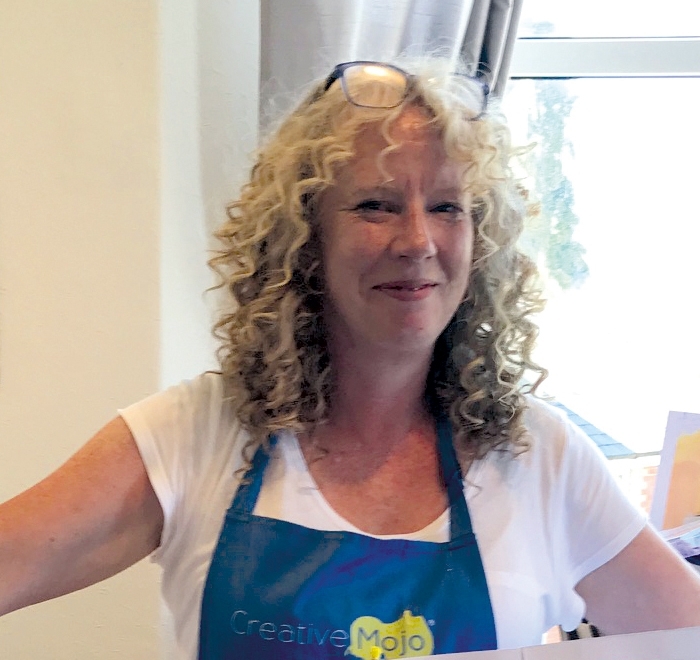 The Creative Mojo opportunity found me as much as I found it, quite by chance, but I couldn’t stop thinking about it once the seed was sown; a chance to run my own business AND be creative! Well, here I am, up and running the Greater West London territory, I couldn’t be happier. I cannot begin to explain the sheer joy of being able to tease out people’s creative side; we all have one, despite protest on occasion. The smiles from residents, their families, staff and volunteers when they see what’s been created at the end of a session, truly is priceless and almost always exceeds their own expectations. I’m loving every minute doing this, it’s so very rewarding and it is certainly feeding my soul. I am an artist but firstly I am a human being, and meeting other human beings and being able to share my love and passion for arts and crafts with other people who might be less fortunate, is an absolute privilege. I gently encourage everyone to discover an artistic self and just see what happens… just take a brush, dip into the paint and have a go. The biggest reward of this amazing job is to be able to see lots of smiles and happy faces all over the room and to know that everyone had fun and a good time during our session. It is priceless. I cover the Derby area, going out as far as Burton on Trent, Long Eaton and Duffield. My history is in visual merchandising and customer service and Creative Mojo is a way of combining creativity and working with people. I love seeing people smile when they see the finished piece of art for the first time. I also love the way sessions can help visitors interact with loved ones who may have lost some of their communication skills – it gives a shared interest for a few happy minutes. 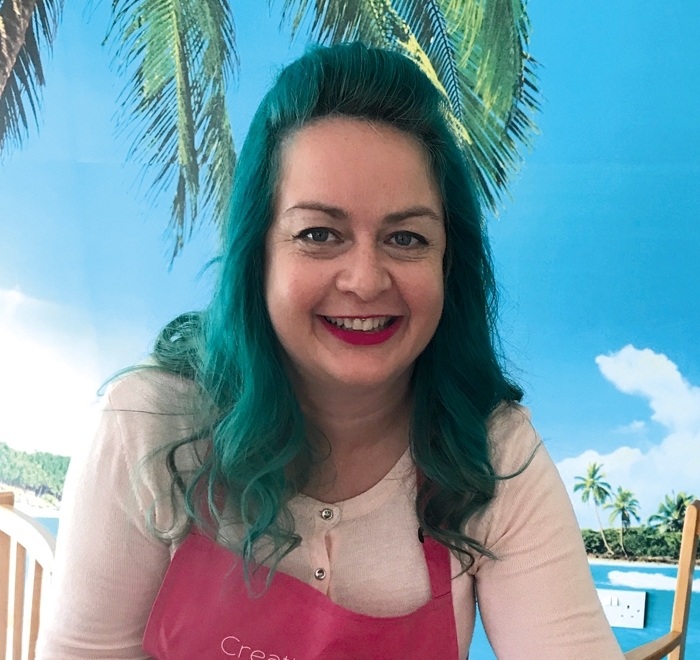 I have run the Clacton-On-Sea Creative Mojo franchise since January 2018. After a 15 year career in the NHS I was ready for a change and wanted to do something worthwhile and rewarding whilst also improving my work:life balance. 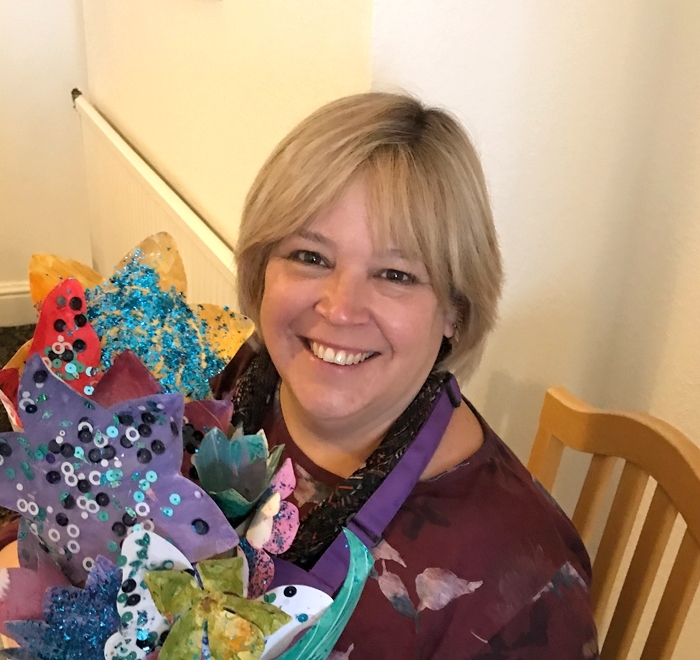 I have always enjoyed being creative and am thrilled to now have a job that enables me to bring the joy of arts and crafts to residents of different backgrounds and abilities. It is a privilege and a joy to work with such a wide range of amazing people. I have loved crafting ever since I was a young child. So much so that as an adult I thought a house was not a home without a craft space or even a craft room. For years I have been selling anything from handmade cards and gifts in local shops to brooch bouquets for that special wedding. 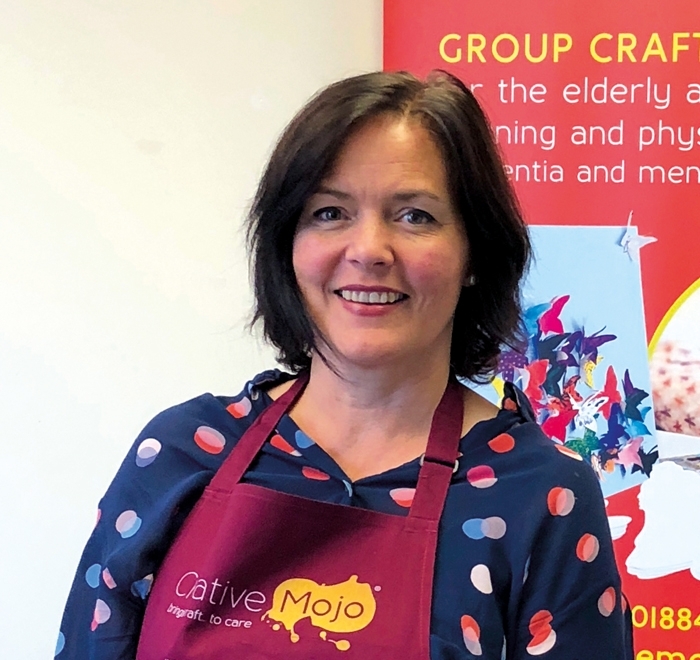 It had always been a dream of mine to take arts and crafts into care homes and when I saw the details about Creative Mojo I realised I could do it professionally with their help and support. I love spending time looking for ideas which to the untrained eye look difficult to achieve but are actually quite easy for anyone to do. I then enter the homes with my arms full of art and craft supplies and a project for the residents to take on. I work with templates as it is less daunting for everyone when they see first hand the shapes they will be using and examples of how the project can look in the end. They can then take ideas from that or use the materials in any way they chose to make individual pieces or a collective collage. The results are always quite outstanding and totally unique as the residents bring to the surface their creative side which may have been hidden for a very long time. We get a chance to talk about the project while they are doing it, what memories it brings to mind, how relaxing it can be and how thrilled they always are as it progresses. The artwork is then either put in their individual rooms or displayed somewhere on the walls in the home and I hope when they have a wee glint in their eye as they see it again that it’s because they remember they had something to do with it’s making.